SageTV users know that there have been a bunch of new fanart add-ons over the past few months, but until now all of those fanart features were only for the SageMC replacement UI and not the default UI (If you're confused on the difference between SageTV Media Center and the SageMC Add-on you're not alone - read this for clarification). Starting today, even if you don't use the SageMC add-on, you can get fanart! First I should clarify what fanart is. Fanart for SageTV are custom background images based on the media you are browsing. For instance, if you are on the recorded TV page of SageTV and looking at the "Scrubs" recordings, you would see images of the Scrubs cast. Same thing for music and movie browsing. 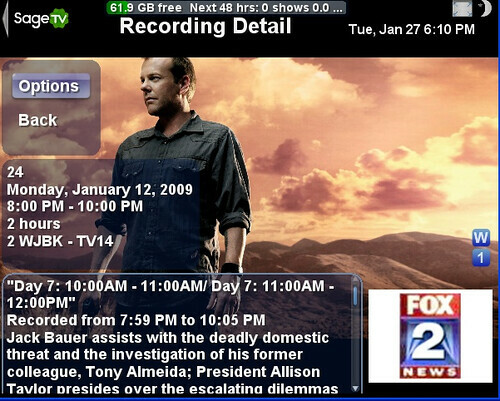 This is the details screen for 24. The background changes to match the show when you enter this screen. 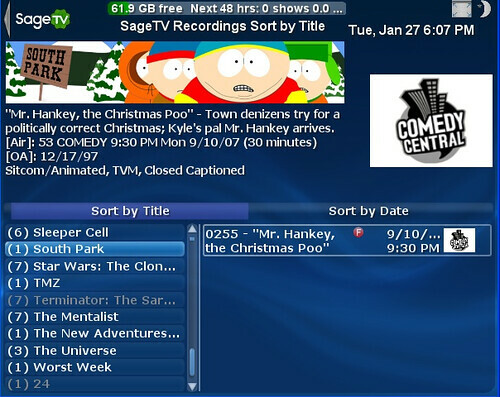 In the Recordings list, you can see a "poster-art" image of the show as you highlight a given show - in this case "South Park". I really like the way this was implemented. Finally, on the Electronic Program Guide, you see the fanart (poster style) as you highlight a given show. Yet another great job by a SageTV user. One of the best things about having a HTPC front-end that allows plugins is the amount of involvement we see from talented guys like this who devote their free time to make plugins that really enhance the end users experience.